A fully functional & ergonomic Chook Dome Tractor is imperative to our garden system. The garden plan involves two domes tracking around four Mandala layouts. The second dome has been built based on this old dome below, and is featured on our page “Chook Dome Building Instructions”. This dome pictured below was built in 2006, small improvements were made during refurbishment in 2012, now it’s back in use and exactly what we want . . . durable & maintenance free. There are plenty of chook domes about, but if you have predators of chooks & eggs, then most I’ve seen just aren’t going to cut it. When you have to worry about dingoes & large pythons who will both take several chooks in a night, or smaller pythons and goannas and rats who will leave no eggs, then your dome will need to be strong and secure. There are two things that set our our dome design apart from others, i.e. we use a third ring for extra strength, and; the use of a ‘T’ junction at the bottom where the ribs join the base ring. The ‘T’ junction also negates the use of criss-cross wires to pull the dome into shape. We also believe against popular opinion, that it is better to attach the tarp to the dome permanently, and peg down the dome, when strong winds or storms come it’s a whole lot stronger. Chooks don’t like constant flapping tarp noises. If you feed your chooks grain supplements as well, then native birds will feed all day. 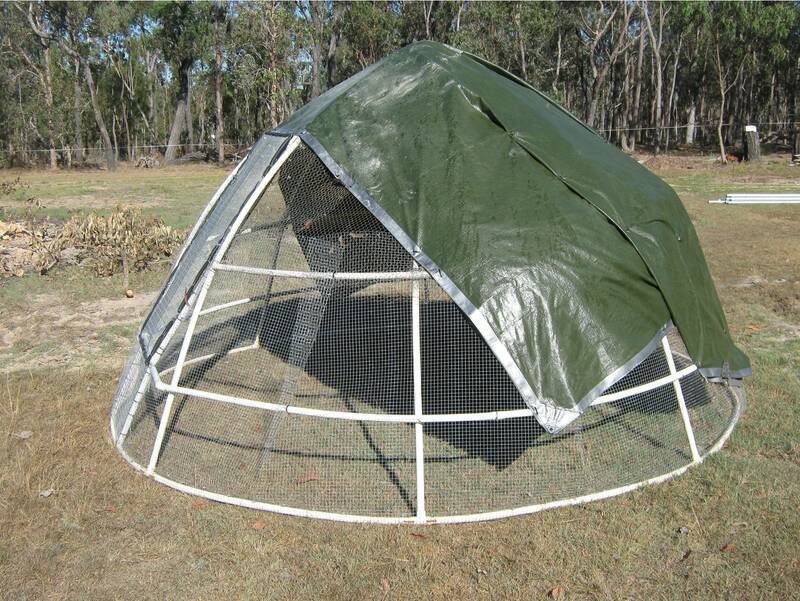 Then dome pictured has small bird wire covering it to prevent birds getting in, and it is behind a dog proof fence. Believe me when I say we had a 7 metre python come one night and take five chooks. If you want to make a dome that is light enough to lift and carry, then we’ve found there is ‘nothing’ you can do to stop a snake of that size, considering the dome doesn’t have a floor, if it did the chooks wouldn’t be able to scratch, so what’s the point? 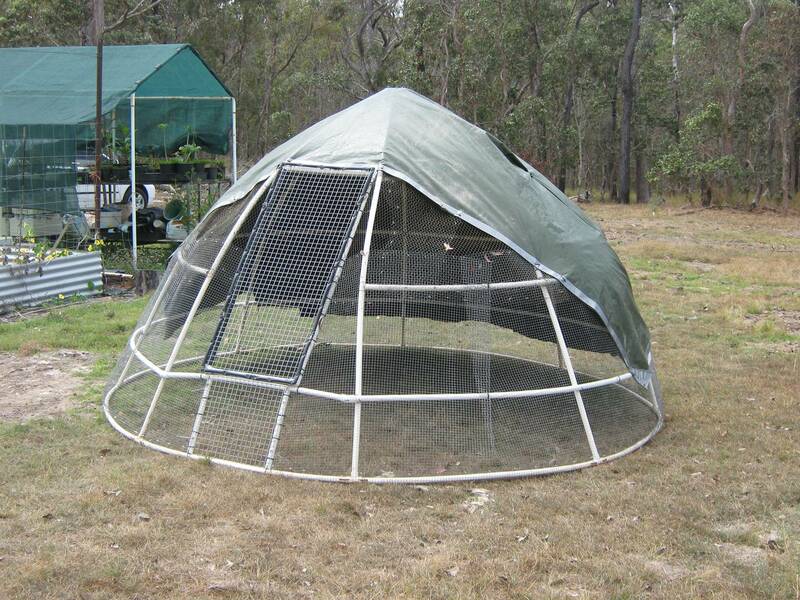 We put a rooster and ten bantam chooks in this size dome. 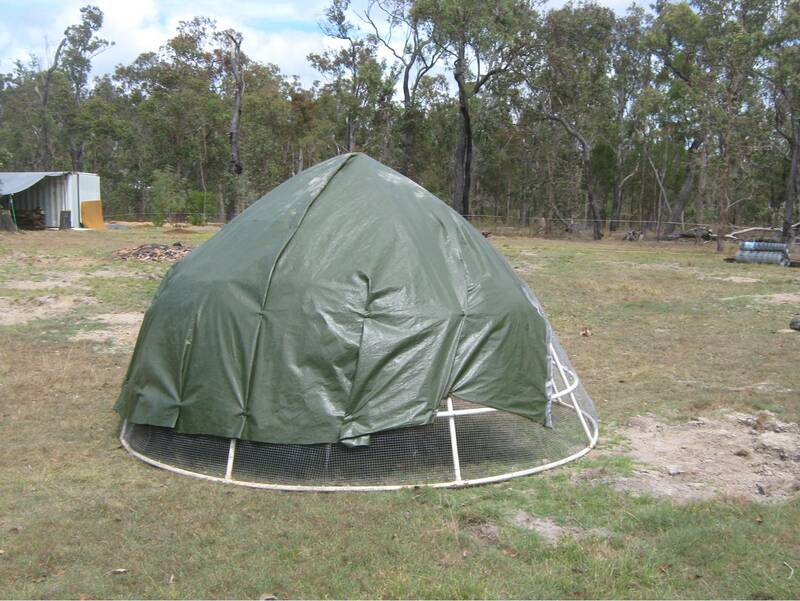 This dome has been in use for many years, it survived the brunt of Cyclone Yasi 2011 intact, shown in the picture above during re-netting and new door in 2012. Cyclone preparation was to peg the dome down using long tent pegs, hammered in at an angle holding the ring at the bottom of each rib. We put 4 square bales of hay inside, positioned against the walls, then soaked them with water. Our chooks sheltered between the bales, and afterward the bales were ckockablock full of worms. We didn’t loose a chook. We have two perches, hanging from the top ring. Our perches are a branch of un-even thickness from about 35mm to 45mm, each chook will choose a position where the diametre is comfortable for the size of their feet. We found the best idea for a nesting box is an old lawn mower catcher, and you only need one, they’ll all use the same one. Water and grain hangs off the ground from middle ring, but under cover of the tarp. The back of the dome is mostly covered for shelter from cold winds in winter and rain in the wet season. Chook dome door detail; Note a little hatch door below the main door, this is to return escapees back in, simply open the hatch and chase them around and they’ll go straight in, it works. The main door and frame is sheathed by soft poly pipe to prevent us humans from getting scratched when going in & out. The doors are 25mmsqu galv arcmesh 2.5mm gauge, sheathed around the outside with 12mm soft black poly pipe held on with ring clips. This door can be thrown open and slammed with abandon & it continues to close without gaps. Three nifty little ‘flick open’ wire hooks hold it firmly closed. Front of dome shows the door section as being ‘flat’ across, so that the door will close without gaps. 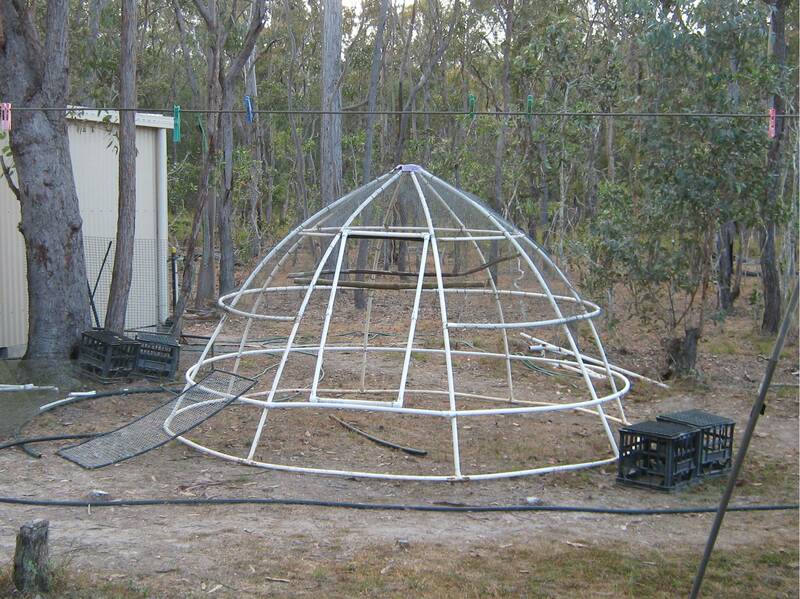 Construction of the dome is 20mm PVC tube, it is rigid yet flexible and importantly light weight and cheap. Black poly pipe is not rigid enough and will end up floppy and out of shape, also will collapse in strong winds. The joins of the ribs and rings are attached by drilling a hole through both and wiring together using 2mm thick wire. Old wire coat hangers are a good source of free wire. The bottom ring of the dome shown here has “T” junctions where the vertical ribs join, this holds the whole frame quite rigid. 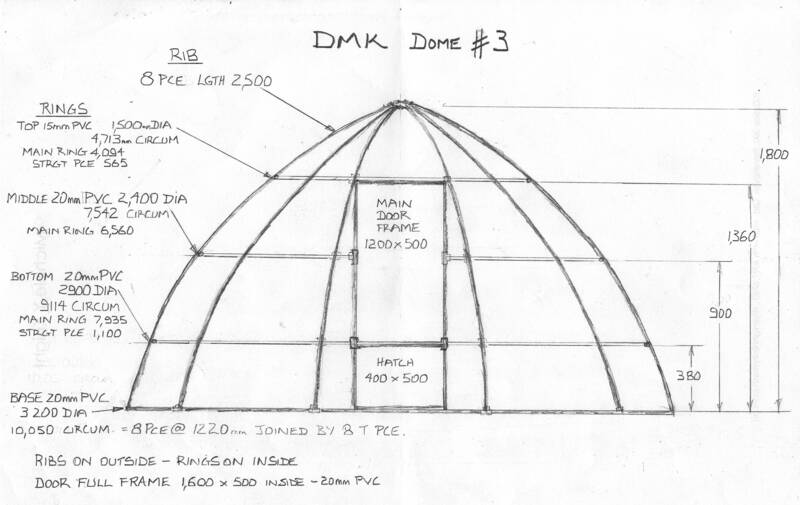 This is a rough dome sketch with sizes and measurements. If you have questions about construction, you can leave a message below. 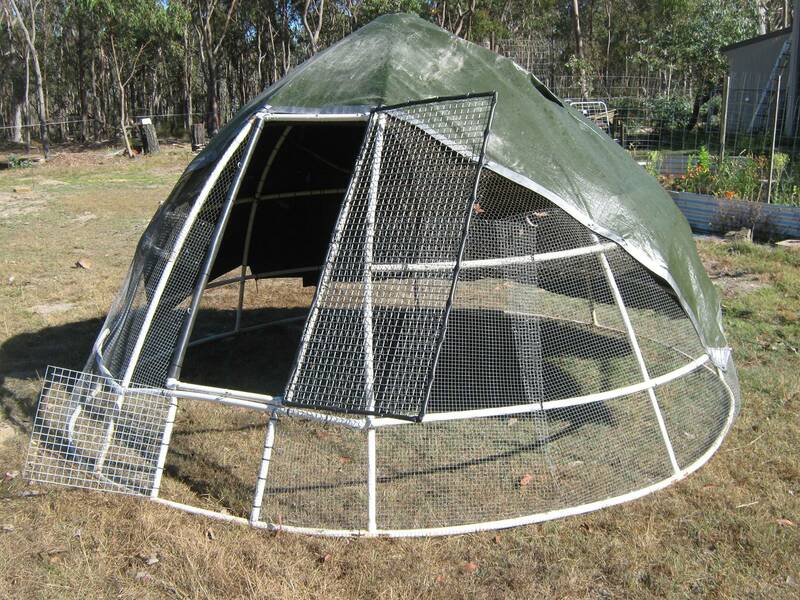 Categories: Cages & Tractors, Chooks, Domes | Permalink.